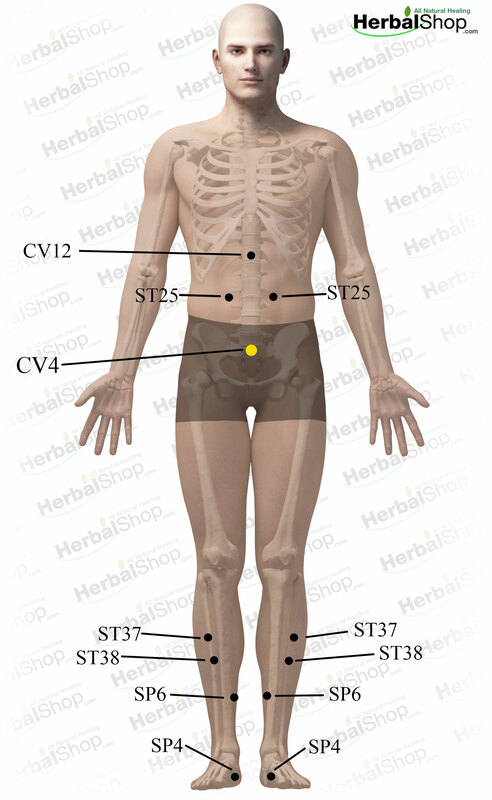 These are the acupressure points for leaky gut syndrome. Working on these points can help you get better faster. You do not have to use all of these points. Using just one or two of them whenever you have a free hand can be effective. Location: On the arch of the foot, in the hollow two finger-width away from the ball of the foot, above the tendon of big toe. Benefits: colitis, diverticulitis, crohn’s disease, gastric pain, vomiting, sour stomach, immune deficiency disorders, chronic fatigue, cancer of the stomach, inflammation of the stomach, gastric ulcers, internal hemorrhage, ascites, pleurisy, epilepsy, arthritis, depression, anxiety attacks, irritable bowls. Location: on the midline of the abdomen, 3 body inches below the belly button. Four fingers-width below the belly button.